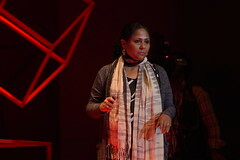 Speakers from this first session of TEDxDhaka 2014 are focused on breaking barriers of discrimination, traditional education, and the way we view a fading historic place. 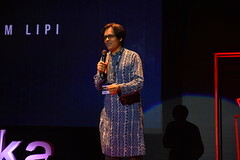 Our first speaker, Iqbal Habib, spoke on inclusive housing and living conditions in Dhaka. 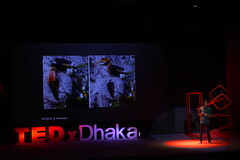 According to Habib, the urban slums in Bangladesh house some 60% of the urban population. They are vast areas of notoriously unplanned establishments where inhabitants live in dire conditions. 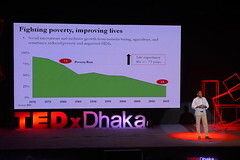 With little to no ventilation, unhygienic facilities and insufficient space, the slums of Dhaka are home to the poorest of the poor. Though often overlooked by policymakers, these slum inhabitants contribute an amazing 10% of total GDP due to their hard work and resilience. ”We have forced them to live like this,” says Iqbal Habib, an urban population activist. The key to addressing these citizens’ critical living situation is convincing policymakers to adopt a more inclusive attitude. 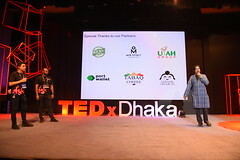 Habib, when contributing in the construction of the Hatirjheel Begunbari Integrated Development Project, set out to break traditional perceptions about slum dwellers. He proposed that the government build a housing complex for anyone forcibly evicted because of the project. Because of his vision, the Hatirjheel area now showcases a scenic bridge over a lake and is notably devoid of congested slum areas. Near the lake, a tall residential building is under construction for the 256 evicted slum dwellers. “Wasteland can be a dreamland,” maintains the architect. His initiative broke barriers of non-inclusive housing policies, and triggered awareness among policymakers. According to Habib, the poorer tiers of the population can comfortably pay for their own housing, with interest, in a period of 10.5 years. 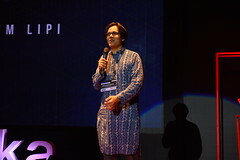 Garments industry leaders in Bangladesh who employ millions of people, are now undertaking housing initiatives for their workers. Policymakers have provided investment incentives to make this possible. 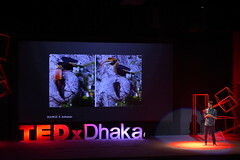 Next onstage was Munem Wasif, photographer of enchanting Puran Dhaka. Once the capital of Mughal Bengal in the 17th century, Old Dhaka (Puran Dhaka) is now a subset of Dhaka, the capital city of Bangladesh. It is a fascinating place, filled with old mughal buildings and narrow alleyways. Wasif was first drawn to the place by its mysticism and liveliness. He yearned to discover the depths of Puran Dhaka. Meandering down its winding streets, Wasif began to capture a series of images of people going about their daily lives. His photos capture vivid images of Puran Dhaka’s inhabitants. He displays their emotions in a brilliant play of light and dark. 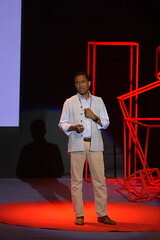 Our third speaker of the day was high school student Shehzad Noor Taus. 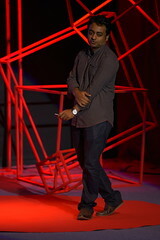 He took the stage to discuss innovation and the future of technology. According to Taus, technology transcends all disciplines. From businesses managing big data, to mathematicians solving problems, medics taking medical information, and people engaging in social media, technological development is helping across numerous fields. At the core of technological advancement lies software programmed to work in specific ways. Taus, one of the youngest Zend certified coders, believes that technological innovation can happen only when the barriers between disciplines are broken. A software developer will not be able to build a software that understands the problems faced by a doctor when treating patients. Only a doctor can truly understand the actual problem and therefore, he or she should be the one to develop a software catering to the needs of the profession. But, only 0.3% of the population produces software. This means the majority of the world’s population are ill-equipped to find software-based solutions to their problems. 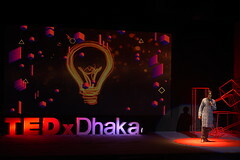 Our last two speakers from session one are two tech savvy youth, Abrar Zawad and Safwan Rahman. 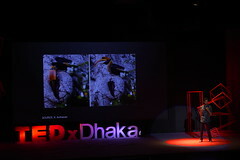 Aged 9 and 12, Abrar and Safwan connect their talk back to the Chronicles of Narnia. They compare their own experiences learning to use technology with the experiences of their favorite storybook characters. Abrar and Safwan thank The Tech School for allowing them to approach education in a new way. The afterschool program allows its students to participate in professional projects. “Students are trained so they can soon become apprentices, teachers, or developers,” says Safwan.